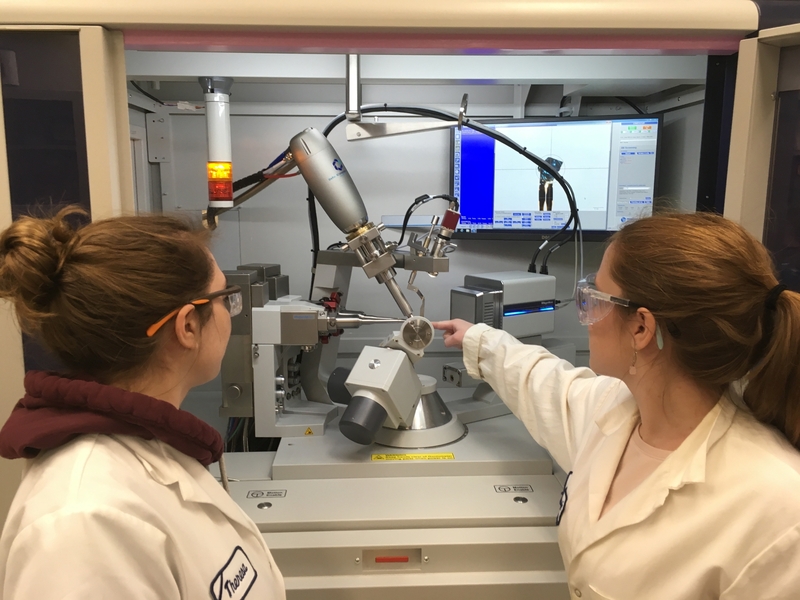 The chemistry department recently received funding for a new X-ray diffractometer from the NSF’s Major Research Instrumentation (MRI) program. The principal investigator on the proposal, Professor William Jones, along with co-investigators Professors Rich Eisenberg, Ellen Matson, Michael Neidig, and Daniel Weix, successfully demonstrated the current need for this new instrument in support of their respective research programs. Additional strong contributions to the proposal came from Professor Kathryn Knowles and crystallographer Dr. William Brennessel. Rounding out the team was Ms. Debra Haring, whose superb technical expertise with grant proposals made for a smooth process. Purchased in late 2017 and housed in the X-ray Crystallographic Facility in B04 Hutchison Hall, the new instrument has been operational for one year now. After careful consideration the department chose a Rigaku Synergy-S diffraction system, equipped with dual Cu and Mo microfocus X-ray sources, a HyPix-6000HE HPC detector, and a Cryostream 800 temperature controller. The instrument is capable of collecting complete data for publication in as little 10-20 minutes, although most small molecule experiments take 1-4 hours. For times when the queue is long, two to three data collections per day are not unusual. Identification of substances can occur within minutes. In addition to the fast turnaround, the new instrument is able to produce high quality data on small powder samples and efficiently collect data on small macromolecules or preliminary data for larger proteins. Perhaps the most amazing capability is its ability to yield high quality structures from extremely tiny crystals, ones that were unable to be examined on the old instrument. The obtaining of funding for the new instrument is only half of the success story. The usage statistics tell the rest. The number of publishable crystal structures has increased by 180 % from calendar year 2017 (old instrument) to 2018 (new instrument), and that for structures of strictly organic molecules has gone up by 750 %. The huge increase of the latter is due in large part to the ability to work with smaller crystals. Students and researchers are fully trained on the diffractometer by taking graduate level course CHM 416, X-ray Crystallography. Additionally, undergraduate students are introduced to the instrument during a laboratory session in CHM 234, Advanced Laboratory Techniques. As part of the outreach program, researchers at local colleges and universities can submit samples for pro bono analysis. In many cases crystal structures are essential to achieving publication of their work or they allow the work to be reported in higher echelon journals. Samples from researchers at more distant colleges, universities, and other non-profit organizations are also accepted. Details about the new X-ray diffactometer and specific experiments can be found at http://www.chem.rochester.edu/~xray. For additional queries, please contact the staff at xray@chem.rochester.edu.